This product is available at Ebay, Aliexpress, Banggood, Amazon.com, Gearbest, GeekBuying, Amazon.co.uk. 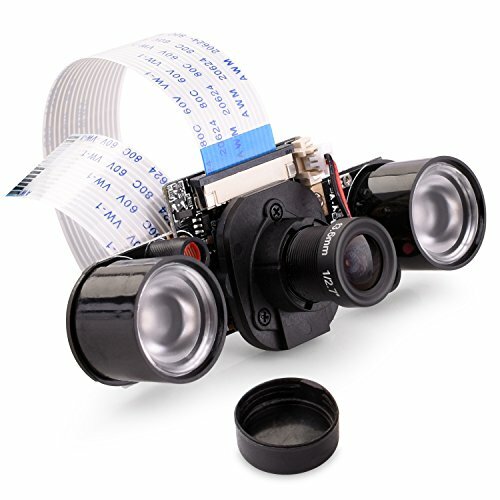 At ebay.com you can purchase 5MP 1080P Infrared Night Vision 69.9° Camera Board Surveillance For Raspberry Pi for only $11.88, which is 64% less than the cost in GeekBuying ($32.99). The lowest price of Raspberry Pi 5MP Camera Module Fisheye Lens FOV160 was obtained on 8 February 2019 2 h 06 min. The NoIR (infrared sensitive for night vision) cameras compatible with the official version for the Raspberry Pi 3 (or Pi Zero Plus) are usually manufactured around an OmniVision OV5647 CMOS sensor. It is a 5MP sensor capable of producing a still image of 2592×1944 pixels and a 1080p30 video stream. It is compatible with the V4L2 driver on Linux. There are LED lighting kits (2 x 3W) that allow night vision over ten meters. Led lighting can be purchased separately in the event of a breakdown.